The private aviation market is in a constant state of evolution and expansion. Thanks to the way that the private jet industry has revolutionized the way individuals and businesses use aviation to meet their flying needs, opportunity to take part in aircraft ownership has become a reality for many people. With private aviation programs—like fractional aircraft ownership—rolling out in full force, the accessibility to private jet ownership and the benefits stemming from it are more accessible than ever before. Flying by private jet takes a ton of the hassle and stress out of flying, saving time and allowing for a more productive use of your time and energy when you land at your destination. Not only that, but avoiding security, delays, and shockingly-loud infants can make the travel experience not just bearable, but pleasant! Thanks to the more affordable fractional aircraft ownership, there has been a spike in overall interest. This increased interest in private aviation has led to the introduction of a variety of jet card programs and fractional aircraft ownership options. Learning what options are available for you can pave the way to taking the hassle out of traveling. 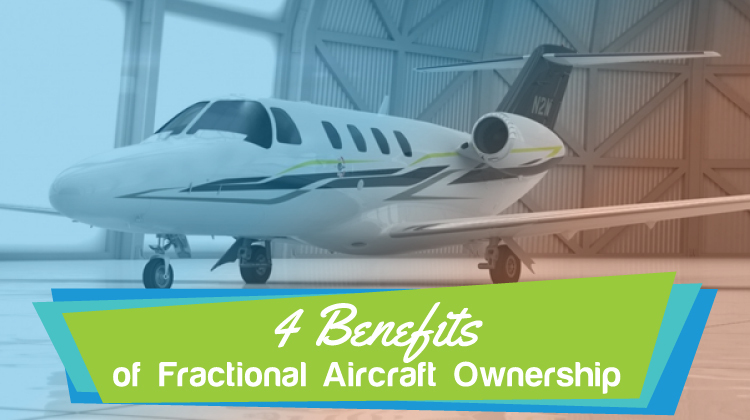 Fractional aircraft ownership offers individuals and businesses all the benefits of full aircraft ownership at just a fraction of the cost of owning a whole aircraft, and it removes the need to take part in any management responsibilities. Consider your needs and then tailor your own investment to accommodate your business and/or personal travel requirements. Fractional aircraft ownership agreements typically last for five years and come with a “bank” of hours that you have access to over that period. As you use hours stored in your “bank,” the grand total decreases. After a 24-36 month period, you can leave the fractional aircraft agreement if you like, or you have a chance to look into adjusting your agreement to perfectly match your specific needs. If you decide to leave the program after the obligated period has passed, depending on the type of aircraft and the amount of interest you’ve purchased, most fractional aircraft ownership companies guarantee repurchasing your ownership shares at a fair market value. This can be an important factor to consider before signing an agreement. The main takeaway is to realize that all of the benefits of private jet ownership can be customized to your individual needs and budget. Much like the variance in how many hours you want to fly, you are also able to tailor your flight experience to your own particular wants and needs. Do you want personalized catering from a professional chef? How many crew members do you have in mind? What about ground support, transportation, and trip scheduling in general? Thankfully, a fractional aircraft program manager will be there to take all of your requests and find a way to make them happen. As with hours, just be aware that your needs are closely related to associated costs. But expenses such as fuel, aircraft maintenance, landing fees, and other costs will likely be covered under your fractional aircraft agreement, leaving you free to determine more interesting options. Another benefit of fractional ownership is flexible availability (often with as little as 4-10 hours’ notice), depending on the type of aircraft and the amount of shares you’ve acquired. Good fractional aircraft ownership programs unconditionally guarantee that, when you call for your aircraft, either your aircraft or a comparable one will be dispatched straightaway. If your desired trip requires a different kind of aircraft to meet your travel needs, you may be able to exchange it for other models in your operator’s fleet at a predetermined exchange rate. Whether you’re wanting to fly tomorrow or a month down the road, it’s nice to know that your availability options are flexible! So what does it take to start my own fractional aircraft ownership adventure? Start with learning about what options are available. As long as you educate yourself about all the programs and rewards accessible to you (and choose the one best suited to your needs), you’re well on your way to reaping the benefits of private aviation. Enjoying all of the perks that come with private aviation—and avoiding a lot of the headaches that come from commercial flying—is a real option. Fly anywhere you want at any time; get to your destination on your terms; and get ready to experience and whole new world of freedom!